To date, wardrobes coupe, corner wardrobes and dressing rooms are an inherent part of any home or apartment, in most modern of planning new apartments dressing room is provided initially. It is important when designing a dressing room to order competently and effectively organize the interior space, make good use of every inch of space, and at the same dressing room would be convenient to use. Walk-in closet provides an efficient place a large number of things and provide easy access to them, with the usual dimensions it replaces two or three cabinet compartment. In the dressing room can comfortably accommodate almost everything: from clothes hangers, boxes and baskets for clothes, shoes, bags and ironing board, tumble dryer, vacuum cleaner in the space provided economic unit. Furniture company ART-DESIGN offers the manufacture of bespoke dressing rooms for individual projects. Sometimes two types of accommodation and making dressing rooms. Very often, they are made in the form of lockers - compartment. Typically, this built-in storage, which makes maximum use of all available space, with lots of accessories such as galstuchnitsy, bryuchnitsy, Shoe cabinet, linen baskets. The second option is the most popular in recent years - it is a separate dressing room with special storage systems. By good approach, our experts can equip a room in virtually any room, including the room of irregular shape, and equip it with modern and functional furniture to suit your needs. Let us dwell on it dressing rooms. This variant of the organization dressing the most convenient and functional. As we have already mentioned, in modern apartments originally envisaged dressing room, but even if it does not, it is very easy to organize, separating part of the room dividers and doors coupe. In principle, the dressing can be stored in almost everything - from seasonal and everyday clothing to household items and appliances: vacuum cleaner, ironing board and sporting equipment. It is therefore almost always dressing room under a certain order is made individually for each room. To a dressing room there was an order to it was easy to use, it is important to properly and effectively plan the space, and it is important to properly organize the storage of things. That is why there are a large number of different storage systems. The system is a very common accessory for dressing the Italian company VIBO. Underwear storage used wire basket and pull the plastic trays of different width and height. In every woman's wardrobe is usually present a large number of summer and winter footwear, and for this there are special pull-out shelves for shoes that allow carry multiple pairs of shoes for each other. Also there VIBO Shoe cabinet with pull-side mounted, allowing to hold up to six pairs of shoes. For storage of trousers and ties provided pull bryuchnitsy and galstuchnitsy, just a side or top mount. All of these wardrobe systems can not only make a more roomy dressing room, but also very comfortable to use, as all slide elements provide excellent visibility and easy access to stored things. We should also mention the comfortable lower the bar for hangers - pantographs. Thanks Pantagraph we are able to get easy access to the clothes on hangers stored on inaccessible height on the ceiling. This ensures maximum utilization of the space dressing room from floor to ceiling. Thinking over the dressing room, you must immediately provide that other than things can be stored there. You can make a special compartment under the ironing board, dryer, ladder, vacuum cleaner, as well as for sports equipment, such as a skiing, snowboarding, skating, and even a bicycle. 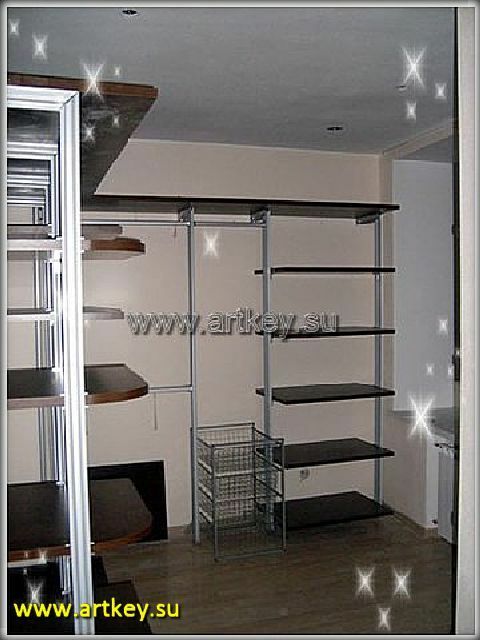 Under the ceiling is usually made either pantographs with clothing or solid mezzanine shelf, which is very convenient to store things such as the overall ski and shoe boxes or bags. Modern dressing rooms sometimes include wall mounted rack systems that allow you to organize placement of things in the most convenient way. 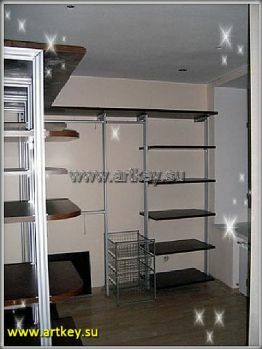 Wall mounted metal rack systems can rearrange the shelves in height. But such systems are much more expensive and usually large dressing rooms. Very often, the entrance to the dressing room separate sliding door or two-door coupe, as it is comfortable, functional, and have the opportunity to make two-sided mirror doors, which is also very important for women to see from the comfort of dressing. For the dressing room you can make ordinary door coupe, as well as false door coupe, which have lower rail. In suspension systems make better use of the system of the Finnish company KIRENA. Through the use of high-quality accessories, materials, reliable hardware and modern furniture production technologies, we can ensure that your wardrobe closet or dressing room furniture will last you a long time.